Most people think of bourbon when they think of Louisville, but Louisville is increasingly becoming known as a culinary destination. My fiance and I just got back from spending a long weekend in Louisville. We packed down as much food as we could, but barely made a dent in Louisville’s culinary offerings. Our first stop was Butchertown Grocery (1076 E Washington St), located in the Butchertown Neighborhood just east of downtown Louisville. Butchertown was once home to inventor Thomas Edison and it used to also be home to many butcher shops and meat processing plants. The neighborhood has reinvented itself into a young and vibrant neighborhood in recent years with distilleries, art spaces, and funky stores. Butchertown Grocery is housed in an 18th century building that used to be a family-owned grocery store. The inside is very chic with marble tables, mosaic tile floors, and an exposed wood ceiling. They serve both lunch and dinner and the menu features mainly European inspired dishes. I couldn’t resist ordering the mixed green salad with pears, pecans and a scoop of jalapeno blue cheese ice cream. Yes, you read that right. Ice cream. On a salad. It was divine. The ice cream actually had a very mild flavor and it was fairly sweet. If you are a fan of sweet and savory foods you have to try this salad! The ice cream made the salad taste wonderfully cold and refreshing. We also tried the Basil Fed Escargot and the Orecchiette with spicy sausage, charred broccolini, ricotta, tomato, and lemon. The escargot was so buttery with lots of melted gruyere and a mild herb flavor and the Orecchiette was fresh and extremely flavorful. The food presentation was first rate and it tasted as good as it looked. Other menu highlights include a Bloody Mary served with a shank of bone marrow, Chicken and Waffles, and Gnocchi with Mushrooms. The service was impeccable. Our waitress was knowledgeable, attentive, and friendly. If you go for dinner, be sure to visit the upstairs lounge, Lola, open from 6pm to 11pm. Bistro 1860 (1765 Mellwood Ave) serves French-American Fusion Cuisine. Executive Chef Michael Crouch has constructed a menu with creative flair. You are sure to try something at Bistro 1860 that you have never had before. For me it was Geoduck. 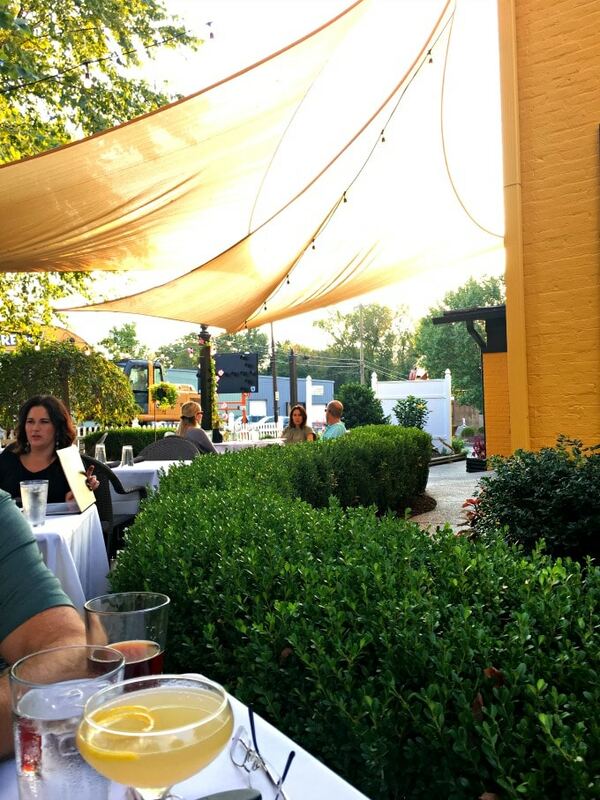 The inside of Bistro 1860 is filled with intimate dining areas, but it was such a lovely day we chose to eat on the charming outdoor patio. I rarely turn down outdoor seating. Especially when it is this nice. Bistro 1860 not only has a full menu of amazing cocktails, they have an extensive wine bar and their cruvinet system keeps up to 54 opened bottles of wine fresh for up to 6 weeks. The food menu at Bistro 1860 is truly unique. You can order most of the menu offerings in three different sizes: bite-sized, appetizer-sized, and entree-sized. Stick with bite-sized or appetizer-sized and you can try lots of different things. And you will want to. The menu is both varied and enticing. Although it does make ordering a little more complicated because you can put together your meal in a myriad of different ways. We started with the Hamachi Ceviche and Geoduck Carpaccio which was a special. The Geoduck was unlike anything I have ever had before and I would definitely order it again. The Ceviche was beautifully presented and served with homemade chips. Next we had the Lobster Hush Puppies and Hudson Valley Duck Confit Strudel. The Hush Puppies were served with lemon hollandaise, blood orange gastrique, and candied jalapenos. They had lots of lobster flavor and those candied jalapenos- Wow! Each bite into them was a wonderful hit of sweet and spicy. The strudel was so rich and flaky and definitely one of the best things I have eaten recently. 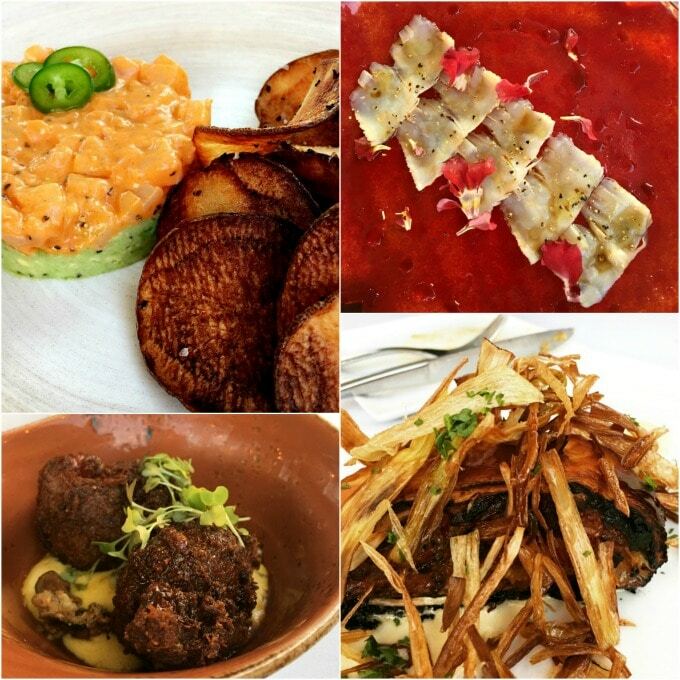 Other menu standouts are Pan Seared Foie Gras, Lamb Tenderloin Tartare, and 72-hour Sous Vide Boneless Beef Short Ribs. The desserts sounded wonderful but we were just too full! 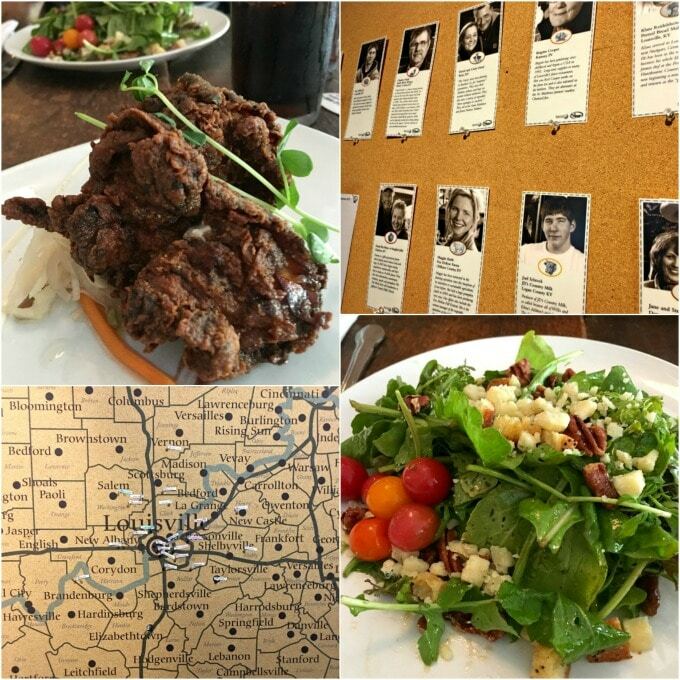 Our second day in Louisville, we had a wonderful brunch at Harvest Restaurant (624 E Market St) . 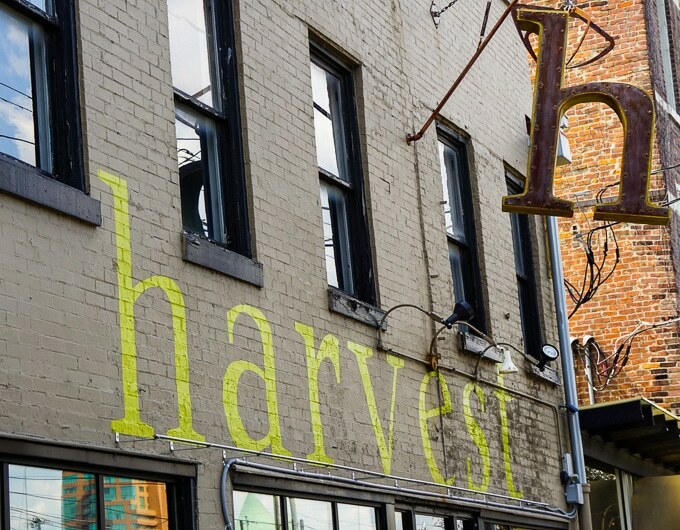 Located in the NuLu Neighborhood, Harvest opened in 2011 and serves seasonal farm to table cuisine. They were nominated for a James Beard Award for “Best New Restaurant” and have a contemporary southern menu that is perfect for showcasing locally grown ingredients. 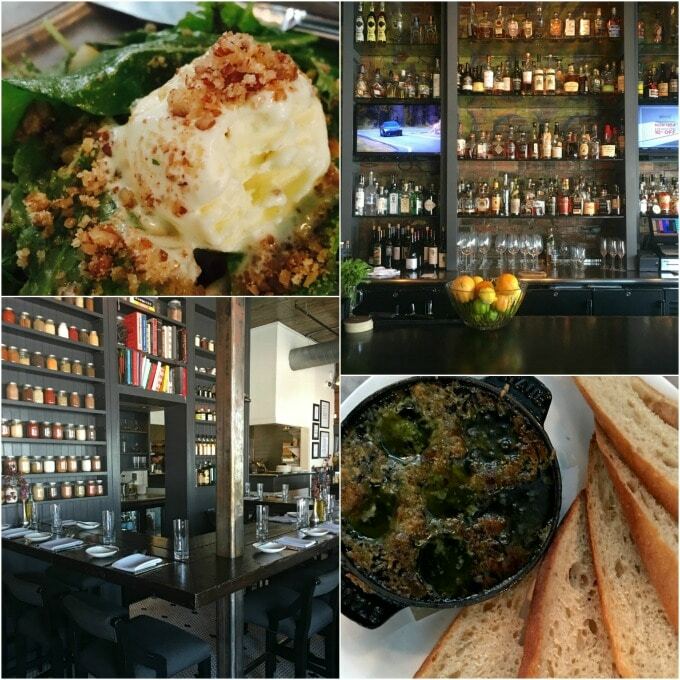 Harvest is open for dinner Tuesday-Sunday and brunch Friday-Sunday. What is most notable about Harvest is that 80% of the ingredients are sourced within 100 miles. 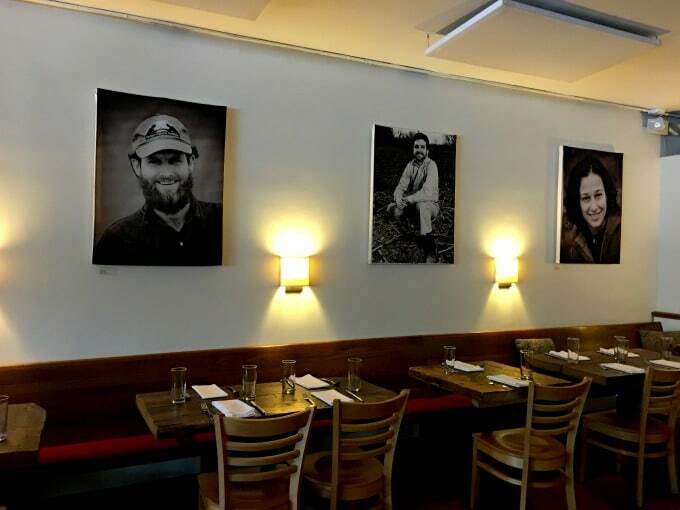 The walls are decorated with black and white photos of the farmers who supply the restaurant and at the back of the restaurant is a bulletin board with information about them. The atmosphere in Harvest is spacious with a mix of modern and rustic. For Brunch we had the Harvest Salad with Bourbon Sorghum Vinaigrette and the Pickle Brined Fried Chicken Thighs served over house slaw with hot sauce. The chicken thighs were boneless and wonderfully juicy. Other menu highlights are Bourbon Queso, Pork Belly Croissant, Brioche French Toast, and Biscuits and Sausage Gravy. 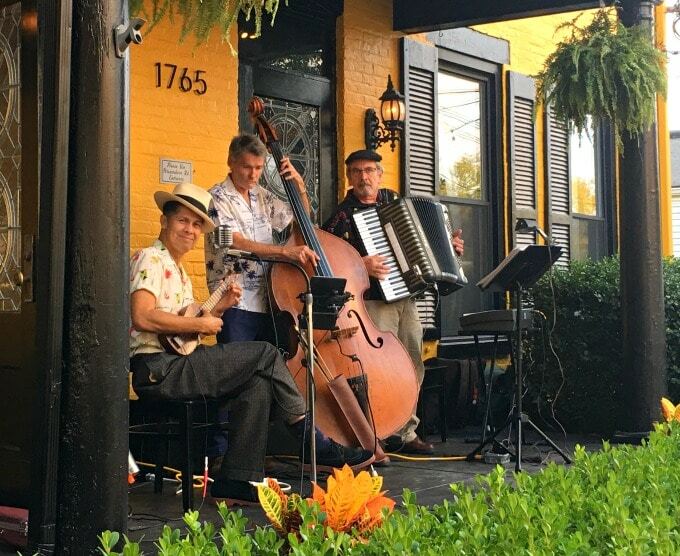 Lilly’s Bistro (1147 Bardstown Rd) is a Louisville institution. 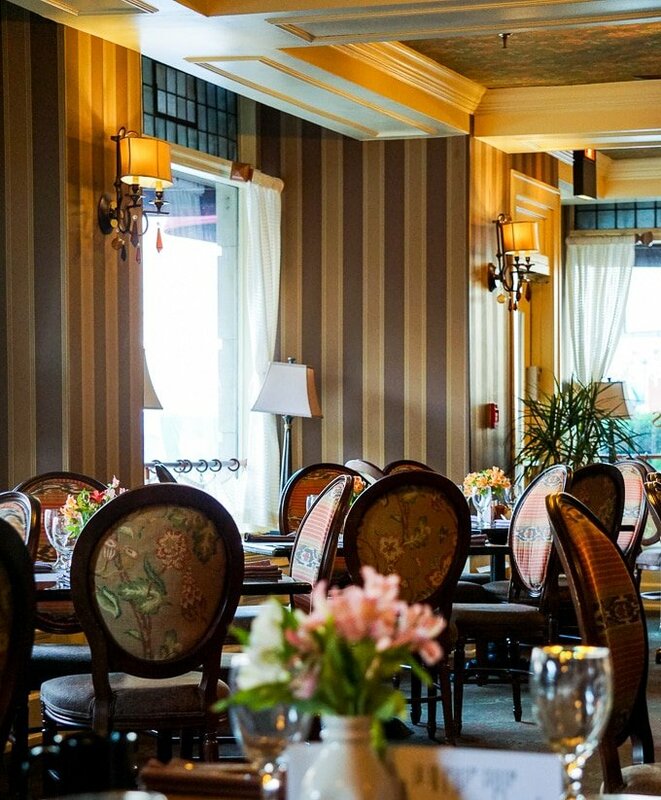 Opened by Kathy Cary in 1988, it was Louisville’s first farm to table restaurant. Cary has been nominated numerous times for the James Beard Best Chef Southeast Award. 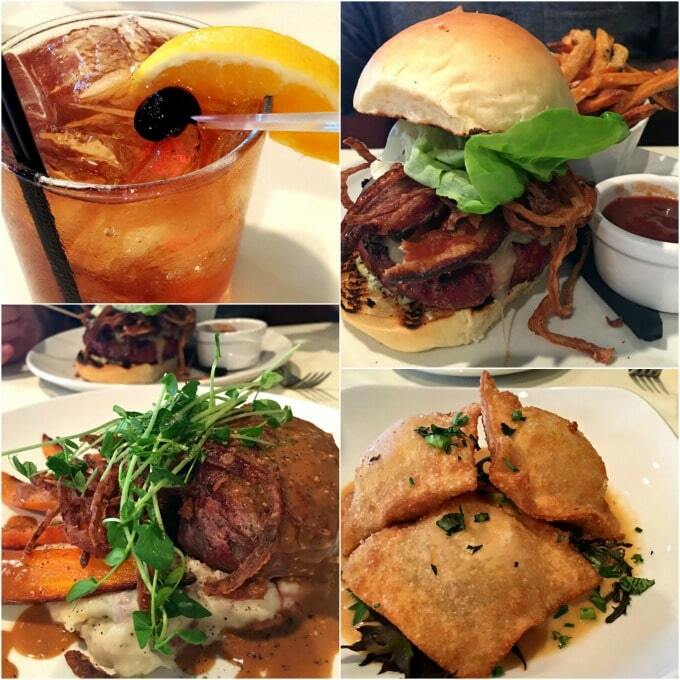 Lilly’s is a place you go for fine dining and local, fresh food along with top notch service is what you can expect. We started our meal with a Peach Old-Fashioned and a fried wonton stuffed with shrimp appetizer served with a sherry cream sauce. The sauce was amazing! For entrees we had the Saratoga Rib-Eye served with honey-rosemary glazed carrots and the Old Hat Cattle Company Burger. It was almost a mile high! 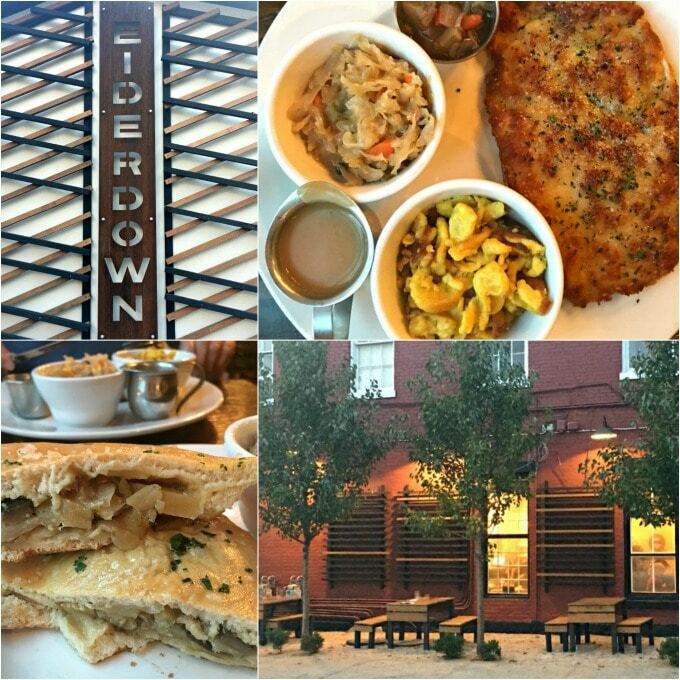 Eiderdown (983 Goss Ave) is a quaint German restaurant in Germantown. Open only for dinner, it has a full bar with the most extensive beer selection in town. Everything is made in house- the sausage, beer cheese, pretzels and dessert. The atmosphere is great for hanging out with friends, a date night, or a family meal which it is affordable enough for. There are plenty of vegetarian options on the menu including a vegan meatball sub. The appetizers are all tempting, including Fest Balls which are crispy balls of fried spatzle and kraut with cheese. I regret not trying the duck fat popcorn. May have to hunt down some duck fat and make that at home. I loved my entree choice which was the Bierock, a calzone-type sandwich stuffed with mushrooms, potatoes, sauteed cabbage, garlic confit, and cheese. It came with the most amazing mustard. Con Huevos (2339 Frankfort Rd) is open for lunch and dinner and serves Mexican food made with really fresh ingredients. It’s a tiny little place with maybe only 5 tables inside and a few outside. My food was incredible. I licked the plate clean even though I wasn’t all that hungry. 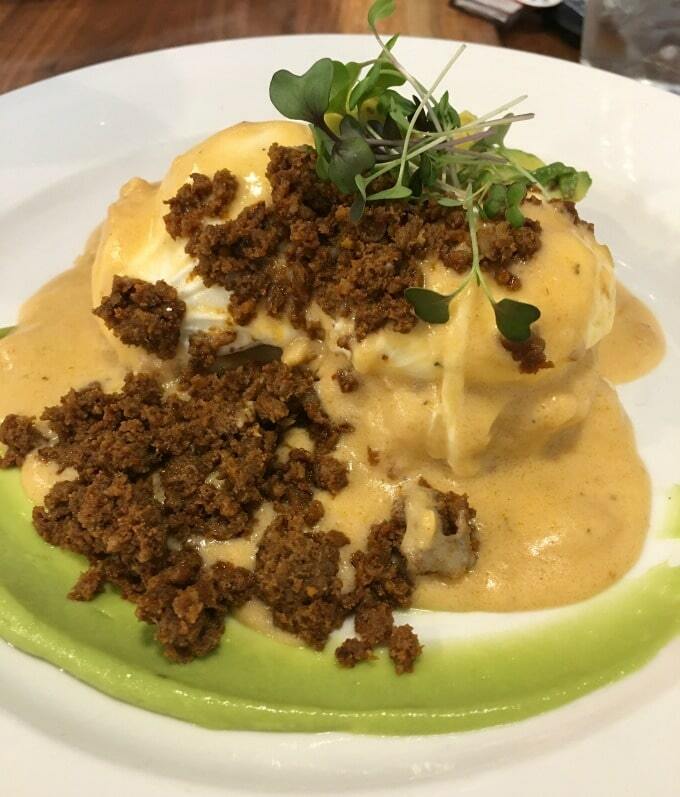 I ordered the Chipotle Poached Huevos- homemade buttermilk biscuits, chorizo, poached eggs, topped with chipotle gravy and avocado. It was served with the most delightful fruit salad. But maybe even better than the food was the coffee. I savored every sip. It will have you coming back for more. I would have loved to have tried the Tres Leches Pancakes. They looked amazing. No foodie trip to Louisville is complete without a trip to The Brown Hotel for the original Hot Brown Sandwich. You can have one for dinner at the upscale English Grill or one for lunch at J Graham’s Cafe. This was my last meal in Louisville and it did not disappoint! 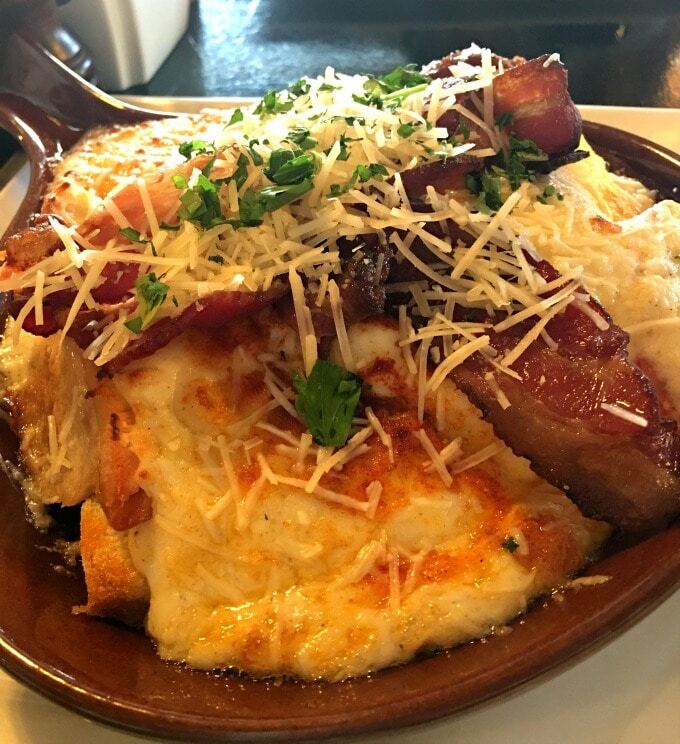 The Hot Brown Sandwich was invented by Chef Fred Schmidt in the 1920s at The Brown Hotel. It’s an open-faced sandwich on white toast, covered with roasted turkey, bacon, a Mornay sauce, and Parmesan cheese. It is made to order and broiled until hot and bubbly. This is totally a knife and fork sandwich. It’s almost like a rich, creamy casserole and no trip to Louisville would be complete without one. There were so many other restaurants I wanted to go to. I had many people recommend The Seafood Lady, Jack Frye’s, Proof on Main, and Wild Eggs. I’ll have to save them for next time! My trip to Louisville was hosted by Go To Louisville. All opinions are my own. 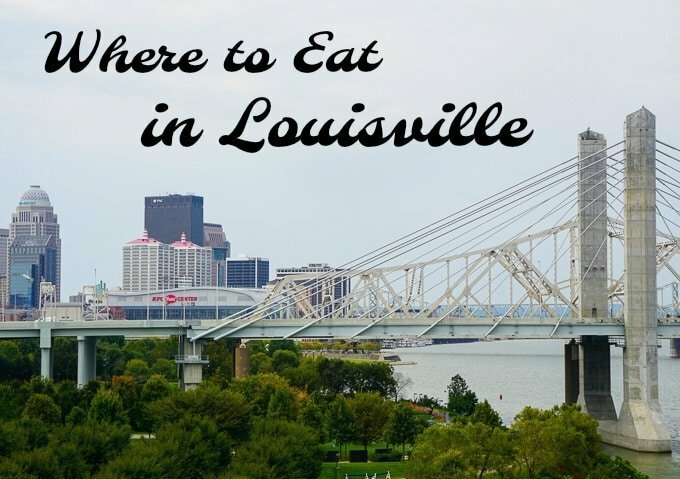 This entry was posted in General, Travel and tagged Louisville, travel. Bookmark the permalink.